A full-frame digital single-lens reflex camera (DSLR) is one with an image sensor format that is the same size as 35 mm format (36 mm × 24 mm) film. Historically, 35 mm was considered a small film format compared with medium format, large format and even larger. The full-frame DSLR is in contrast to full-frame mirrorless interchangeable-lens cameras, and DSLR and mirrorless cameras with smaller sensors (for instance, those with a size equivalent to APS-C-size film), much smaller than a full 35 mm frame. Many digital cameras, both compact and SLR models, use a smaller-than-35 mm frame as it is easier and cheaper to manufacture imaging sensors at a smaller size. Historically, the earliest digital SLR models, such as the Nikon NASA F4 or Kodak DCS 100, also used a smaller sensor. Kodak states that 35 mm film has the equivalent of 6,000 pixel horizontal resolution, according to a senior vice president of IMAX. If the lens mounts are compatible, many lenses, including manual-focus models, designed for 35mm cameras can be mounted on DSLR cameras. When a lens designed for a full-frame camera, whether film or digital, is mounted on a DSLR with a smaller sensor size, only the center of the lens's image circle is captured. The edges are cropped off, which is equivalent to zooming in on the center section of the imaging area. The ratio of the size of the full-frame 35mm format to the size of the smaller format is known as the "crop factor" or "focal-length multiplier", and is typically in the range 1.3–2.0 for non-full-frame digital SLRs. An APS-C format DSLR (left) and a full-frame DSLR (right) show the difference in the size of the sensors. When used with lenses designed for full frame film or digital cameras, full-frame DSLRs offer a number of advantages compared to their smaller-sensor counterparts. One advantage is that wide-angle lenses designed for full-frame 35mm retain that same wide angle of view. On smaller-sensor DSLRs, wide-angle lenses have smaller angles of view equivalent to those of longer-focal-length lenses on 35mm film cameras. For example, a 24 mm lens on a camera with a crop factor of 1.5 has a 62° diagonal angle of view, the same as that of a 36 mm lens on a 35mm film camera. On a full-frame digital camera, the 24 mm lens has the same 84° angle of view as it would on a 35mm film camera. If the same lens is used on both full-frame and cropped formats, and the subject distance is adjusted to have the same field of view (i.e., the same framing of the subject) in each format, depth of field (DoF) is in inverse proportion to the format sizes, so for the same f-number, the full-frame format will have less DoF. Equivalently, for the same DoF, the full-frame format will require a larger f-number (that is, a smaller aperture diameter). This relationship is approximate and holds for moderate subject distances, breaking down as the distance with the smaller format approaches the hyperfocal distance, and as the magnification with the larger format approaches the macro range. Two photographs with the same lens and ISO, but a different sensor size: upon zooming in (insets), one notices there is less noise in the bottom picture (full-frame sensor - Canon EOS 6D) than in the top one (smaller sensor - EOS 7D Mark II). There are optical quality implications as well—not only because the image from the lens is effectively cropped—but because many lens designs are now optimized for sensors smaller than 36 mm × 24 mm. The rear element of any SLR lens must have clearance for the camera's reflex mirror to move up when the shutter is released; with a wide-angle lens, this requires a retrofocus design, which is generally of inferior optical quality. 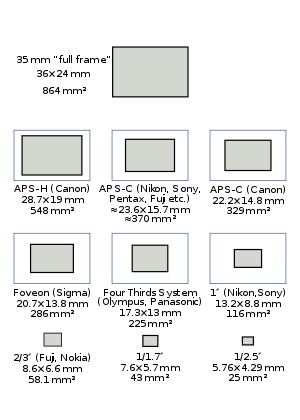 Because a cropped-format sensor can have a smaller mirror, less clearance is needed, and some lenses, such as the EF-S lenses for the Canon APS-C sized bodies, are designed with a shorter back-focus distance; however, they cannot be used on bodies with larger sensors. The full-frame sensor can also be useful with wide-angle perspective control or tilt/shift lenses; in particular, the wider angle of view is often more suitable for architectural photography. While full-frame DSLRs offer advantages for wide-angle photography, smaller-sensor DSLRs offer some advantages for telephoto photography because the smaller angle of view of small-sensor DSLRs enhances the telephoto effect of the lenses. For example, a 200 mm lens on a camera with a crop factor of 1.5× has the same angle of view as a 300 mm lens on a full-frame camera. The extra "reach", for a given number of pixels, can be helpful in specific areas of photography such as wildlife or sports. Lower size sensors also allow for the use of a wider range of lenses, since some types of optical impurities (specifically vignetting) are most visible around the edge of the lens. By only using the center of the lens, these impurities are not noticed. In practice, this allows for the use of lower cost glass without corresponding loss of quality. Finally, full frame sensors allow for sensor designs that result in lower noise levels at high ISO  and a greater dynamic range in captured images. Pixel density is lower on full frame sensors. This means the pixels can be either spaced further apart from each other, or each photodiode can be manufactured at a slightly larger size. Larger pixel sizes can capture more light which has the advantage of allowing more light to be captured before over saturation of the photodiode. Additionally, less noise is generated by adjacent pixels and their emf fields with larger photodiodes or greater spacing between photodiodes. For a given number of pixels, the larger sensor allows for larger pixels or photosites that provide wider dynamic range and lower noise at high ISO levels. As a consequence, full-frame DSLRs may produce better quality images in certain high contrast or low light situations. Production costs for a full-frame sensor can exceed twenty times the costs for an APS-C sensor. Only 20 full-frame sensors will fit on an 8-inch (200 mm) silicon wafer, and yield is comparatively low because the sensor's large area makes it very vulnerable to contaminants—20 evenly distributed defects could theoretically ruin an entire wafer. Additionally, when full-frame sensors were first produced, they required three separate exposures during the photolithography stage, tripling the number of masks and exposure processes. Modern photolithography equipment now allows single-pass exposures for full-frame sensors, but other size-related production constraints remain much the same. Some full-frame DSLRs intended mainly for professional use include more features than typical consumer-grade DSLRs, so some of their larger dimensions and increased mass result from more rugged construction and additional features as opposed to this being an inherent consequence of the full-frame sensor. The Nikon E2/E2s (1994), E2N/E2NS (1996) and E3/E3S (1998) digital SLRs as well as the similar Fujifilm Fujix DS-505/DS-515, DS-505A/DS-515A and DS-560/DS-565 models used a reduction optical system (ROS) to compress a full-frame 35mm field onto a smaller 2/3-inch (11 mm diagonal) CCD imager. They were therefore not digital SLRs with full-frame sensors, however had an angle of view equivalent to full-frame digital SLRs for a given lens; they had no crop factor with respect to angle of view. The first full-frame DSLR cameras were developed in Japan from around 2000 to 2002: the MZ-D by Pentax, the N Digital by Contax's Japanese R6D team, and the EOS-1Ds by Canon. Nikon has designated its full frame cameras as FX format and its smaller sensor cameras as the DX format. ^ Nigel Atherton; Steve Crabb; Tim Shelbourne (2006). An Illustrated A to Z of Digital Photography: People And Portraits. Sterling Publishing Co. Inc. ISBN 2-88479-087-X. ^ Ross Hoddinott (2006). Digital Macro Photography. Sterling Publishing Co. Inc. ISBN 1-86108-452-8. ^ "/Film Interview: IMAX Executives Talk 'The Hunger Games: Catching Fire' and IMAX Misconceptions". Slash Film. December 2, 2013. Retrieved December 17, 2013. ^ "Retrofocus Design Problems: A Synopsis". Camerarepair.com. Archived from the original on 2013-01-03. Retrieved 2010-12-30. ^ "The Canon Camera Story: 2001-2004". November 2004. Retrieved 2009-09-26. ^ Barbara Gerlach (2007). Digital Nature Photography: The Art and the Science. Focal Press. p. 67. ISBN 978-0-240-80856-7. ^ Bourne, Scott. "Seven Myths About the Need for Full Frames". Retrieved 15 October 2013. ^ "Studio shot comparison". November 2019. Retrieved 2019-02-06. ^ "Full-frame sensors". Photocrati. Retrieved 2010-12-30. ^ "Canon's Full-Frame CMOS Sensors: The Finest Tools for Digital Photography" (PDF) (Press release). Canon. 2006. Archived from the original (PDF) on 2010-10-10. Retrieved 2009-12-26. ^ "Canon U.S.A. Introduces The New Canon EOS-1D X Digital SLR Camera, Re-Designed From The Inside Out" (Press release). Canon U.S.A. October 18, 2011. Retrieved October 18, 2011. ^ "Canon Announces Its Smallest and Lightest Full-Frame Digital SLR Camera For Serious Photographers" (Press release). Canon U.S.A., Inc. September 17, 2012. Retrieved September 17, 2012. ^ "Nikon D3x press announcement as of November 30th, 2008". Press.nikonusa.com. 2008-11-30. Archived from the original on 2011-01-10. Retrieved 2010-12-30. ^ "Nikon D3s press announcement as of October 14th, 2009". Press.nikonusa.com. 2009-10-14. Archived from the original on 2011-01-10. Retrieved 2010-12-30. ^ "When There Is No Second Chance: The New Nikon FX-Format D4 Multi-Media Digital SLR is The Definitive Unification Of Speed And Precision" (Press release). Nikon Inc. January 5, 2012. Archived from the original on September 1, 2012. Retrieved January 6, 2012. ^ "Expectations Surpassed: The 36.3-Megapixel Nikon D800 Is The Multimedia HD-SLR That Shatters Conventional Resolution Barriers For Maximum Fidelity" (Press release). Nikon Inc. February 6, 2012. Archived from the original on August 14, 2011. Retrieved February 7, 2012. ^ "Fall in Love Again: New Df D-SLR is Undeniably a Nikon with Legendary Performance and Timeless Design" (Press release). Nikon Inc. November 4, 2013. Retrieved November 5, 2013. ^ "Performance that Fuels the Passion: The New Nikon D600 Puts FX-Format in Focus for Photo Enthusiasts" (Press release). Nikon Inc. September 13, 2012. Retrieved September 13, 2012. ^ "Concentrate on the Clarity: The New Nikon D610 FX-Format D-SLR Places Emphasis on the Image Making Experience" (Press release). Nikon Inc. October 8, 2013. Retrieved October 8, 2013. ^ "Sony α DSLR-A850 press announcement as of August 27th, 2009". News.sel.sony.com. 2009-08-27. Retrieved 2010-12-30. ^ "Sony introduces full-frame α99" (Press release). Sony. September 12, 2012. Retrieved September 17, 2012. ^ "Technical information on Nikon E2/E2s and Fujifilm Fujix DS-505/DS-515 at MIR - Photography in Malaysia". Mir.com.my. Retrieved 2010-12-30. ^ "Technical information on Nikon E2N/E2Ns and Fujifilm Fujix DS-505A/DS-515A at MIR - Photography in Malaysia". Mir.com.my. Retrieved 2010-12-30. ^ "Technical information on Nikon E3/E3s and Fujifilm Fujix DS-560/DS-565 at MIR - Photography in Malaysia". Mir.com.my. Retrieved 2010-12-30. ^ Jarle Aasland, Nikon E2N, NikonWeb.com. ^ "The long, difficult road to Pentax full-frame". dpreview.com. ^ "Canon EOS-1Ds, 11 megapixel full-frame CMOS". dpreview.com. ^ "2013 Full Frame DSLR Comparison Guide". www.gizmag.com. ^ – Charlie White (2007-03-08). "Charlie White's Gizmodo PMA March 8th, 2007 report on Sony press announcement in regard to Sony Alpha flagship model "CX62500"". Gizmodo.com. Retrieved 2010-12-30. ^ Paul, Matthias (2009-09-30). "Sony Alpha CX model codes overview". Minolta-Forum (in German). Archived from the original on 2016-04-01. Retrieved 2016-01-01.